We’d love your help. 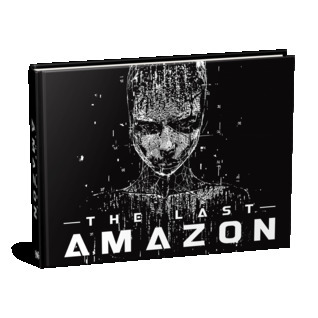 Let us know what’s wrong with this preview of The Last Amazon by Jamison Stone. To ask other readers questions about The Last Amazon, please sign up. This review has been hidden because it contains spoilers. To view it, click here. If you are searching for a post-apocalyptic hyper-realistic Graphics Art Novel you will want to check out The Last Amazon due out next month. Danni Winters (Lauren Drain Kagan) and other cosplay models immerge and contribute to this storyline. Combining these strong women with dialog boxes, blog posts, detailed interviews, illustrated infographics, and theories made this storyline seem all the more plausible. This story is set in the same universe as Rune of the Apprentice and is a prequel to Rune If you are searching for a post-apocalyptic hyper-realistic Graphics Art Novel you will want to check out The Last Amazon due out next month. This story is set in the same universe as Rune of the Apprentice and is a prequel to Rune. I know World War II lasted about 6 years. Tragically, I learn, World War III causes the collapse of civilization in significantly less time than it would take me to paint my nails. Yes! The world building is awesome and it's easy to see that societal divisions are influenced with espionage and Artificial Intelligence. I love the introduction into this photo-realistic novel and felt the pace flowed very well. It grabbed me at “1 Warning found’ and held me with patterns of data, and many outstanding illustrations. Most significant to me was the empathy I felt when reading the manifesto which was dated April 25th, a day that we know indicated the end of WWII and heralded the start of the Cold War. Beyond that, I found the names, data routing, ID, medical exam, security breach, and memorandum very illuminating. In the year is 2050, only two cities remain, The Denver Denizens, and Hawaii's Azureus Islands. This is a difficult book to describe just because there is almost nothing quite like it. It could be called a "graphic novel" because, in the most literal sense, that's what it is. However, that term is usually synonymous with the comic book format. In that case, the way I would describe the book is as a "picture book for adults", but unfortunately that sounds a little disparaging and does not not convey the book's incredible sophistication. You can read a description of what the book is about ab This is a difficult book to describe just because there is almost nothing quite like it. It could be called a "graphic novel" because, in the most literal sense, that's what it is. However, that term is usually synonymous with the comic book format. In that case, the way I would describe the book is as a "picture book for adults", but unfortunately that sounds a little disparaging and does not not convey the book's incredible sophistication. You can read a description of what the book is about above, but it's not necessarily the story that makes this a great book (although the fact that the story is indeed good certainly doesn't hurt! ); instead it's the way it's presented that makes it remarkable. The story is told through letters, emails, news reports, social media posts, and tons of other creative devices making for an incredibly immersive and engaging experience that neither prose nor comics can hope to match. In the past, we've seen plenty of examples of taking analogue experiences and presenting them in a digital format, but this is really the first time I've seen someone take a digital experience and present it on paper, and it works surprisingly well! You would never know this book was produced via Kickstarter, the caliber of the writing, art, graphic design and physical quality of the book itself exceeds anything you would expect from a major publisher. A very interesting adventure, told in a surprising way all this superbly illustrated. I loved it and I look forward to the next part. Congratulations to the whole team.